Just some random musings this evening. I realize that it's a bit pitiful that I was only able to come up with four. Do NOT go to the grocery store when you have PMS. As I was unloading my cart on to the conveyor belt I was somewhat embarrassed. Seriously. My husband was so sweet to let me go to the Ladies' Night Out, for the ladies from church, even though it was his birthday. Thanks Scott! If you want to see some serious work and concentration, give A. a paper punch, some scraps of paper and a glue stick. She will punch her little heart out and then glue it back together. Want to get involved in a fun swap? 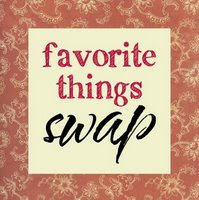 Kelly is organizing a favorite things swap. It's open to everyone in blogville and sounds like fun. Hurry, you have until June 8th to join in. I think I'm going to jump on board. I just wrote a post on making links within your blog . check it out and let me know if it makes sense. it isn't hard, but hard to explain.. Thanks Scott for letting Holly come over and play tonight at LNO!! Ever wondered what you all know about basic health stuff?? Hey girl, It sounds fun! I'm I bit nervous- So it could be anyone? I guess I need to be brave and just have fun with it! You are getting to be the Pro Blogger!!! thanks for the plug! i love free publicity! I'm so glad you commented on my blog today so that I clicked on yours and saw this, I just emailed Kelly. Also, I finally linked you so that I can quit reading your comments and saying "Who's Holly?" and then not be able to find your blog again. I'm retarded. hi holly- i clicked in after i saw the link in jill's blog. i am so excited to see a runner's blog! i'm training for my 2nd half marathon and thinking i might try for the full...not too sure i want to commit yet. i'm definitely a newbie runner, so i'm sure i'll be checking your blog to see what you're up to!